In the past, Devolo have made some of our favourite powerline networking devices, such as the Devolo dLAN 500 AVtriple+ and the Devolo dLAN 500 AVplus. However, Devolo has noticed a problem with powerline networking devices, which is something it's tried to rectify with the branding and marketing of the new entry-level Devolo dLAN 500 WiFi Network Kit. The problem is, not many people know what powerline networking is, or how it can help them improve their wireless connectivity throughout their house. Devolo's response to this is to rid the box the Devolo dLAN 500 WiFi Network Kit comes in, along with any marketing materials, of confusing jargon that means little to the majority of people. Instead, there are big, bold promises of easily improving the reach of your network and internet connection - both wired and wireless - throughout your house. Time will tell if this marketing push will pay off, but we can still check out the product itself to see if it delivers on these promises. 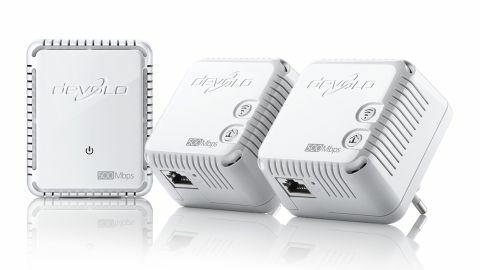 The Devolo dLAN 500 WiFi Network Kit we tested came with three adapters, which we feel is about the right amount if you want to make sure you have a good spread of Wi-Fi throughout the house. You can buy a cheaper kit that includes just two devices, and you can buy additional dLAN 500 WiFi units to increase the range. Each kit comes with a dLAN 500 duo adapter, which plugs into the wall near your modem or router. It has two Ethernet ports, one for connecting up your modem/router, and another for connecting a non-wireless device to your network, such as a Blu-ray player or smart TV, which is a nice addition and can save you having to buy an expensive proprietary wireless adapter. The body of the dLAN 500 duo adapter is small and discreet, which means it can be hidden away in your living room. However, because of its size, and the fact that the Devolo dLAN 500 WiFi Network Kit is an entry-level product, there's no plug socket pass-through, unlike the more expensive Devolo dLAN 500 AVplus. A pass-through means you don't lose a power socket when you use a powerline adapter, and it can also be used to filter the power supply, strengthening the network connection and minimising interference. If you want these features, you should go for the Devolo dLAN 500 AVplus. The other adapters are dLAN 500 WiFi units. Again, they are small and compact, but come with just one Ethernet port for non-Wi-Fi devices. However, each unit can take the network being sent through the powerline and turn it into a Wi-Fi signal. This is a far better solution than Wi-Fi repeaters like the AVM FRITZ!WLAN Repeater 310, which often struggle to boost weak wireless signals. A quick touch of a button can turn the Wi-Fi signal on or off, and another button lets you quickly pair up the adapter with the others. They are only single band, but can broadcast up to 801.11n, which offers fast and strong wireless signals. Each unit can broadcast their own network SSID, effectively creating a number of separate wireless networks around your home, or they can be used to project the same network throughout your house. This option, that uses Wi-Fi Move technology, is particularly useful if you don't want to have to type in passwords for a number of different wireless networks in your home. Setting up the kit is remarkably easy, and the three units found and communicated with each other straight away. Further tweaks to the new network are done quickly and easily with Devolo's easy-to-use software, which also comes as an app for iPhones and Android devices. Transfer speeds were 66.08Mbps on average between two PCs - not bad - and there was plenty of scope for streaming media, but we've seen much faster speeds with the Linksys Powerline HomePlug AV2 Kit PLEK500. For an entry-level home networking kit, we can happily recommend the Devolo dLAN 500 WiFi Network Kit. It's an excellent choice if you're struggling to get Wi-Fi out in the further reaches of your home or garden. It's quick and easy to set up, with good transfer speeds. It doesn't have some of the advanced features of more expensive powerline networking solutions, but for the price it's an excellent buy.